Two yeast strains were tested for expression of rhodopsin. In Saccharomyces cerevisiae, 2.0 ± 0.5 mg/L were expressed, of which only 2 to 4% were correctly folded.33 In Pichia pastoris, 0.3/L were produced, of which 4 to 15% were reported functional.34 Rhodopsin is expressed in functional form in Xenopus laevis oocytes35 and in Chinese hamster ovarian (CHO) cells,36 although yields have not been reported. For small scale (microgram range) preparation of rhodopsin, transient transfection in the COS cell system37 is the most widely used method. Typical wildtype expression yields are 25 |j,g protein/15-cm dish. FIGURE 11.2 Amino acids on the cytoplasmic surface of rhodopsin studied by cysteine mutagenesis. Highlighted in black letters are all residues that have been mutated to cysteines one at a time (see single cysteine mutants in Table 11.1, top). All other amino acids are omitted from this graph, except those in the C-terminal tail. Residues studied by cysteine mutagenesis are shown as black letters; those that have not been studied are shown as gray letters. Cysteines that have served as fixed reference points in di-cysteine mutants (see text) are marked in bold. These cysteines were fixed in mutants, where a second cysteine was systematically varied. The resulting pairs are listed in Table 11.1, bottom. systems have proven to be the most useful in terms of providing microgram to hundreds of milligram quantities of active rhodopsin, respectively. A refined antibody affinity purification scheme allowed one-step purification of rhodopsin from native and recombinant systems.37 Other alternative affinity chromatography methods include concanavalin A affinity purification of rhodopsin from natural sources and immobilized metal affinity chromatography in correlation with insect cell expression work.1249-51 An in-depth review of expression of GPCRs other than rhodopsin can be found in Chapter 8 of this book. 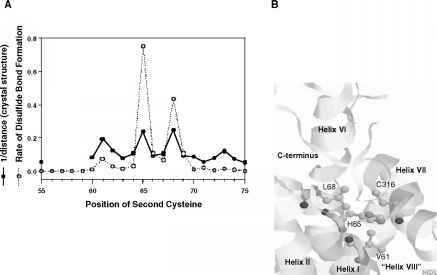 The structure and dynamics of the CP loop regions and CP ends of the helices of rhodopsin in solution were investigated using a combination of cysteine mutagenesis followed by biochemical and biophysical studies of the cysteine mutants. Figure 11.2 shows the residues on the CP side of the molecule that were replaced, one at a time, by cysteine. The top section of Table 11.1 lists the single cysteine mutants. 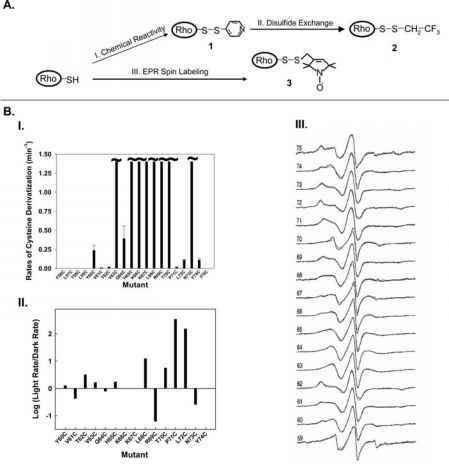 In separate experiments, pairs of cysteines (di-cysteine mutants) were introduced, as also shown in Figure 11.2 and Table 11.1.
lists some of the biochemical and biophysical probes used to study the structure and dynamics of rhodopsin. The resulting thiopyridinyl derivative of rhodopsin (1) is reactive toward free sulf-hydryl reagents by way of disulfide exchange. The rate of this exchange is an extremely sensitive probe for tertiary structure and has been used to prove the presence of light-induced conformational motions resulting in distinct tertiary structure changes,53 even where EPR methods suggest the magnitude of conformational change to be small.54 For example, changes in the rates of reactions in the dark as compared to the light are shown in Figure 11.3B, Panel II, for residues in the 60 through 74 sequence. To further define tertiary structure in the CP domain of rhodopsin, disulfide bond formation was used to establish proximity between amino acids in rhodopsin,55,56 a method developed by Falke and Koshland57 in studies of the aspartate receptor.58,59 The method is based on structural analysis of disulfides occurring in protein crystal structures that have shown preferred conformations for their formation.60 The distance between a-carbon atoms across the disulfide ranges from about 4 to 9 A in crystal structures, with 95% of all refined disulfides in the range of 4.4 to 6.8 A. The average distances across left-handed and right-handed disulfides is 5.88 ± 0.49 A and 5.07 ± 0.73 A,61 respectively. Thus, the presence of a disulfide bond indicates that the a-carbons of the participating cysteines are about 5 to 6 A apart. However, the geometry derived from crystallography may not hold in solution, especially for mobile regions at protein surfaces.61 The formation of a disulfide bond between two cysteines does not imply a time-average proximity of the two residues in the protein structure. Once the disulfide bond is formed, the two cysteines are locked in a conformation that may not necessarily be favored. The rates of disulfide bond formation were determined for sets of di-cysteine mutants of rhodopsin, in which a cysteine was kept constant at one site while the position of a second cysteine was varied at a proximal region (Table 11.1). The rates of disulfide bond formation were measured for different sets of di-cysteine mutants62 and compared to proximities between amino acids deduced from a crystallographic model.8 The reciprocal of the distances obtained as a function of residue position and the rates of disulfide bond formation are reproduced in Figure 11.4A for disulfide bonds between Cys316 in helix VIII at CP loop 4 and cysteines at positions 55 through 75 in CP loop 1.55 The comparison showed excellent correlation between the rates of disulfide bond formation and the interthiol distances derived from the cysteine replacements in the crystal structure (Figure 11.4B). The three positions that most rapidly formed disulfide bonds with Cys316, H65C, L68C, and V61C, are 4 to 5 A distant from Cys316, and facing it. In order for a disulfide bond to form, however, 3 to 4 A translational movements would be necessary. This requires sufficient flexibility of the amino acids in this region of the rhodopsin CP face. The fact, however, that only those cysteines that faced Cys316 were able to bridge this small gap indicates that no unfolding of the ends of the helices occurs; instead, a movement of intact helices brings residues in CP loop 1 close to Cys316. These results presented the first direct evidence for substantive backbone motion in the CP domain of rhodopsin in solution. FIGURE 11.4 Disulfide bond formation in di-cysteine mutants Tyr60Cys-Tyr74Cys/Cys316.55 A: Rates of disulfide bond formation at pH 7.7, 25oC (dotted lines, open circles). The reciprocals of distances between cysteines in the crystal structure of rhodopsin are shown as black lines, filled circles. (Reproduced with permission from Biochemistry. Copyright, American Chemical Society, Washington, D.C., 1999.) B: Visualization of positions of cysteines placed at sites where fastest disulfide bonds were formed with Cys316 (Leu68, His65 and Val61). 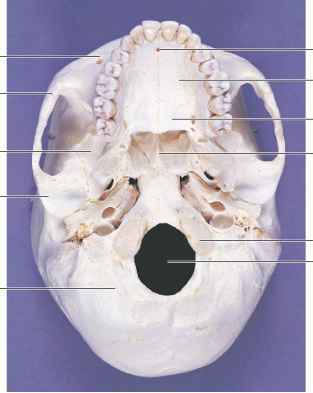 All these positions are in closest proximity to Cys316 in the crystal structure model. Spurred by success with a motionally restricted bacteriorhodopsin system,76 two reports later demonstrated that restriction of rhodopsin rotational diffusion by application of low temperatures75 or lyophilization77 slowed motion sufficiently to permit effective application of CP MAS to analysis of chromophore structure. Interactions in rhodopsin provided evidence that the Schiff base C-N double bond linkage is protonated and in the anti conformation. Furthermore, these experiments supported the presence of negative counter ion(s) in close proximity to the retinyl moiety. Subsequently, a novel method for macroscopic alignment of bilayers on solid surfaces termed isopotential spin-dry ultracentrifugation (ISDU) was applied to rhodopsin preparations in native and reconstituted membranes.90 Angles relative to the membrane normal for individual 2H bonds in the chromophore were determined by this method. However, combining the ISDU-oriented bilayer method with 2H MAS NMR91 modified the experiment such that side band intensity became a function of size and orientation of the quadrupolar coupling tensor, allowing more precise measurement of the C-C(2H)3 bond vector orientation with respect to the membrane normal. Such magic angle-oriented sample spinning experiments were applied to labeled chromophores in reconstituted rhodopsin membranes and ultimately provided a three-dimensional structure and orientation of retinal within the binding pocket of rhodopsin in the ground state and upon photoactivation to the meta I intermediate. As described earlier, dramatic progress was achieved in the field of high-yield recombinant expression of rhodopsin. This progress led to the first use of protein site-specific isotopically labeled recombinantly produced rhodopsin for MAS NMR experiments. Homogeneously [a,e-15N2]-lysine labeled rhodopsin from a baculovirus Sf9 cell expression system was subjected to CP MAS 15N NMR to investigate the Schiff base linkage.9899 The nitrogen of the lysine contributing to the Schiff base linkage was observed to resonate with an isotropic shift signal at 155.9 ppm relative to ammonium chloride.99 This spectrum was correlated with the model of a protonated Schiff base stabilized by a complex counterion. Homogeneously a,e-15N-lysine and 2-13C-glycine di-labeled rhodopsin produced by overexpression in a stably trans-fected mammalian suspension cell line (HEK293S) was also used to investigate Schiff base linkage.39-40 The 15N chemical shift of the lysine contributing to the Schiff base was observed at 156.8 ppm, a chemical shift characteristic of a protonated Schiff base nitrogen that has only weak counterion interactions. The distance between the Schiff base nitrogen and the counterion was estimated at approximately 4.0 A. This distance is consistent with a structural water molecule in the binding site hydrogen bonded with both the Schiff base nitrogen and the Glu113 counterion. These reports demonstrate the feasibility of applying solid-state MAS NMR to structural studies on isotopically labeled rhodopsin and potentially other GPCRs. Rhodopsin Phosphorylation — Phosphorylation of activated rhodopsin is the first step in desensitization of the receptor. A comparison of 31P spectra collected for phosphorylated and unphosphorylated ROS demonstrated the presence of a 31P resonance specific for the phosphorylated sample.107 Limited proteolysis of the C-terminus of rhodopsin, which removes the predicted phosphorylation sites, eliminated the resonance and determination of the pKa obtained from pH titration, indicating it was likely a serine phosphate. While solution NMR was used in some of the earliest studies of rhodopsin-chro-mophore interactions (Section 11.2.1), overall resolution was very poor for the sonicated membrane suspensions and NMR efforts for the most part shifted to solidstate methods. However, with the advent of higher field instruments, novel pulse sequences, and recombinant expression technology, solution NMR can be applied to structural analyses of rhodopsin in a number of interesting ways. Solution NMR was initially used to study the interaction between rhodopsin and the G protein a subunit known as transducin108 via application of a transferred nuclear Overhauser effect (Tr-NOESY)109 experiment to a system containing a fragment peptide of transducin (residues 340 through 350 with Lys341Arg) known to interact with rhodopsin.108 The observed NOEs provided information on distances between various protons in the bound peptide, which along with distance geometry, NOE-constrained molecular dynamics, simulated annealing and grid searches produced a series of structures of the transducin peptide in association with and the excited meta II intermediate. Magnetically oriented bilayer 31P studies indicated that ROS disk membranes, which alone lack the cooperativity in alignment that exists in the intact ROS, actually have sufficiently large total magnetic susceptibility anisotropy to align with their membrane normals parallel to a magnetic field.117 Residual dipolar contributions were observed (identified by smaller 1JNH splittings in 1H-15N HSQC spectra) between light-activated rhodopsin (meta II state) in oriented ROS disk membranes and a selectively 15N di-labeled undecapeptide, closely resembling a fragment (residues 340 to 350) of the transducin G protein a subunit known to interact with activated rhodopsin.117 Information on the conformation of the bound ligand and its orientation relative to the bilayer was determined from the measurement of N-H vector angles of 48 and 40 degrees with the disk normal for the labeled amino acids (Leu5 and Gly9, respectively). Transferred dipolar contributions were observed to return to their isotropic values at a rate determined by the decay of the meta II state of rhodopsin. This magnetically oriented bilayer NMR system provided significantly more conformational information than in the transferred-NOE experiments.108111 Ultimately, this oriented bilayer-transferred dipolar coupling method (including observation of contributions to both 1JNH and 1JCH splittings), combined with determination of approximate distance restraints by transferred NOEs, was used to solve a high resolution structure of the G protein fragment.116 The fragment was shown to take on a helical conformation upon binding to light-activated rhodopsin. The positions and widths of 19F-NMR signals are indicators of chemical environment and mobility118 and are therefore sensitive to light-induced conformational changes in rhodopsin.43 The first solution NMR experiment analyzing the overall structure of full-length rhodopsin was carried out by application of 19F NMR to detergent-solubilized recombinant rhodopsin.43 A number of mutants (produced in HEK293S cells) containing single reactive cysteine residues in different regions of CP faces were labeled with 19F as described above.43 Each of these labeled derivatives specifically located at amino acid residue positions 67, 140, 245, 248, 311, and 316 of the CP face was purified in sufficient quantities for NMR analysis. FIGURE 11.5 [19F]NMR spectra of single cysteine mutants.43 Single cysteine mutants of rhodopsin were derivatized with molecular entity 2, shown in Figure 11.3A. A minimum of 5 mg pure protein was analyzed in dodecyl maltoside micelles. [19F]NMR was collected within 2-min acquisition time (average of 160 scans). Light gray lines indicate NMR spectra in the dark and dark gray lines indicate spectra after illumination. (Section 11.2.3.3).119 Subsequently, this method was expanded to report on measurements of short distances in the CP surfaces by determination of NOEs between 19F labels in di-labeled rhodopsin mutants containing pairs of cysteines.45 Specifically, labels were incorporated at the ends of helices III and VIII (WT Cys140 and Cys316), helices I and VIII (Cys65 and Cys316), and helices III and VI (Cys139 and Cys251), respectively. Distinct chemical shifts were observed for all the labels in the dark state of rhodopsin. Analysis of homonuclear 19F NOEs between the labeled cysteines indicated no evidence of proximity for the WT pair, but significant negative enhancements were observed for the other two pairs. The extent of the observed NOE enhancement correlated well with distances measured in the dark state crystal structure (29.8, 3.9, and 3.0 A, respectively) and emphasized the advantage of this method over EPR distance measurement that has a lower distance limit of 8 A, due in part to the size differences of the respective labels (molecular entities 2 and 3, Figure 11.3A).8 45 A discrepancy between observed rates of relaxation and theoretical calculated values is acknowledged and concise quantitation of the distances was not attempted by this method.